A busy light means that you have made several shots and now your camera is working at processing your pictures, then storing them on your memory card. During that time, the camera’s little brain is fully occupied working on your images. 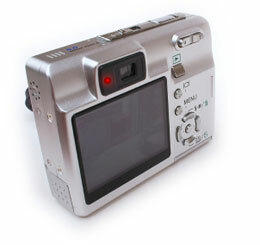 It’s too busy to take any more shots, so no controls will respond – least of all the shutter button. It always drives us NUTS, because that red light always comes on at the wrong time. Right? Why does it happen at the wrong time? The wrong time is when you are trying to take lots of shots in sequence. You camera slows up when you have made it work on a lot of data at once. Give it a break; you’re just the same. So it depends how fast a worker your camera is: some will take ten or more, then the busy light shows and you have to wait a minute or more before you can carry on. And some cameras show the busy light after only one shot, and you have to wait a second before being able to make the next shot. Of course, top professional models can take dozens of shots before slowing down. But you’ve got the camera you’ve got, so the best way to control “camera busy” is with your settings. What are the settings, then? Set the smallest image size suitable for the job. You’ll have to balance needs: you want shots of baby for posterity so you want the best quality, for sure. But if that means missing shots, it may be better to set lower quality but get the shots you want. Set a high compression if available: this also reduces quality, unfortunately, but the smaller file that results is less data to move around. Work in good light with low ISO (sensitivity) settings: the images are cleaner (have less noise) so they are smaller and easier for the camera to process. Do not set it to record Raw files – on some cameras this really slows things down. How do I set a smaller image size? Of course the exact way to do this depends on your camera. You probably have to dive into the Menus, and look for labels such as Picture Quality, Picture Size or Image Size. Some cameras have a specific button for setting image size. Remember that an image around 3000 pixels in length is ample for a 10×8″ print. Setting just one size below the maximum can make a big difference to operational speed. Compression may be called Fine or High Quality, Standard or High Compression – choose Standard for this exercise. Modern memory cards are pretty fast – that is, you can throw lots data at them quickly and it’ll all stick: they have fast “write speeds”. Lower-cost cameras tend not to send data quickly enough to merit using the fastest cards. A good strategy is to use the fastest cards you can afford – if (or when) you upgrade your camera you can take full advantage of the faster write speeds. Depending on your camera, you may find there’s a small speed increase with a faster card. And flash: obviously, waiting to charge up the flash slooows down operation a big heap. So turn that off if possible. Using fresh batteries may help speed up flash charge-up, but won’t make a difference to camera operation. While you’re at it, you may want to speed up the camera’s other responses too; but that’s a different story.